Update: I fixed the Watch Folder video. The original video had some errors during the last 10 minutes. Here are all the videos from the webinar series that I have been running for the past 3 weeks. Also included is the Source Code walkthrough from the Recycle Bin, which was cut for time reasons. A new API-related blog has gone online from Autodesk. BIM Apps! As the title implies, it's BIM related and highlights useful applications. It also serves the API community developing anything BIM related. So if you are an API developer or want to see apps built on our API's, check it out. PS. Don't forget to subscribe to the RSS feed. Update: There is a newer version for Vault 2012. Link Maestro is a rewrite of the Copy Link command. 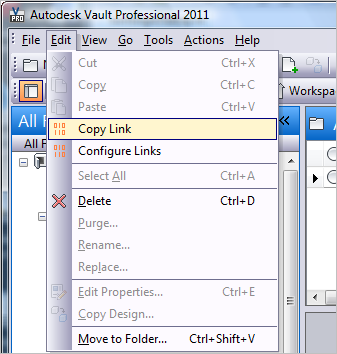 In addition to the default functionality, Link Maestro adds the ability to link to a page in the Vault web client. It can also do multi-site links, which is where each Vault site gets it's own link. 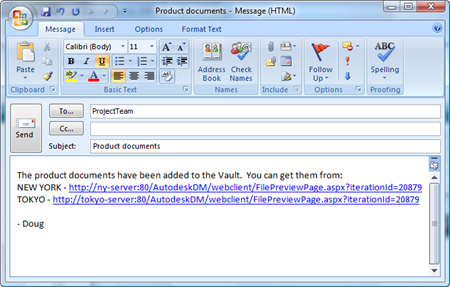 For Vault Professional users, you can now create Item and Change Order links. Some features may not work depending on the Vault product. Under the Edit menu, select Configure Links. A dialog will pop up allowing you to select what link format you want for each object type. Multi-site links require that an administrator first set up the list of Vault sites. I do not recommend storing links to web client pages. These links are not designed for long term use. First, they link to a specific version. So as time goes on, the link will go out of date. Or the version could get purged, which will break the link. Next, the link syntax may change in future releases. Web browser links work best for short term use, such as sending an email to a colleague with a download link. UPDATE: This post applies only to the Vault 2011 release. The Vault 2012 checklist can be found here. 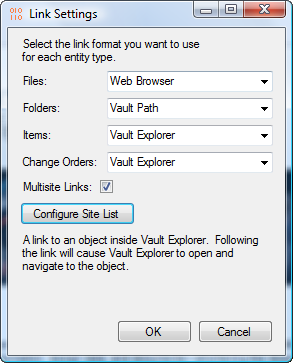 For my first post of the year, I would like to go over the various things that can keep your custom Vault Explorer command from deploying properly. In many of the cases, you don't get an error or anything. Instead, the command just doesn't show up, leaving you to wonder what went wrong. Did you deploy to [VaultClientInstallDir]\Explorer\Extensions\[myExtension]? Does the .vcet.config file have the correct Folder name? Does your assembly have an ApiVersion attribute? Does your IExtension implementation have a default constructor?